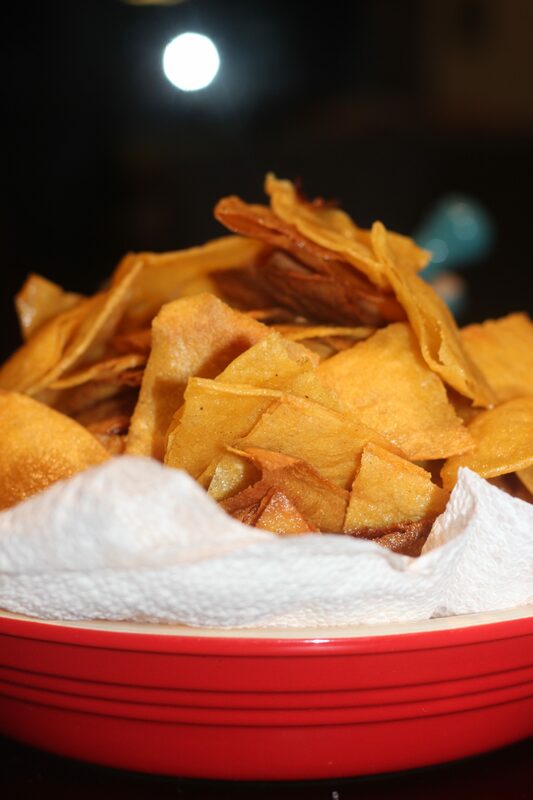 Homemade tortilla chips make a great compliment to fresh salsa and are super easy to make. You literally cannot keep you hands off them. They taste so much better than store bought ones. We LOVE them! All you needs is corn tortillas, oil, salt, and a frying pan. I promise you’ll be impressed by how good these taste. Start by drying out your corn tortillas. You can leave them out overnight or in a 350 degree oven for 5 minutes. I cut mine up into six chips per tortilla and fried them in a single layer in 1/8 inch canola oil in a frying pan. If you have a thermometer you want it to be at 350 degrees. I did not. I just wanted my chips to be crunchy and golden brown so guessed and toggled the temp as needed. An Infrared thermometer would come in handy and this one may be on my birthday list soon. Once they felt like a firm chip with a golden brown hue, put them on a plate lined with a paper towel and toss with course sea salt. My chips were a little chewy in the center before they cooled off completely. These are super easy, and I’m pretty sure my husband wanted to eat all of them before we left for our camping trip. This is awesome! I will need to try making These!